memorial day | I Love You, Momma. John returned to work on Memorial Day, so my mom, step-father, and cousin DeAnna came over to celebrate Memorial Day. I am still not fully recovered and not completely up to hauling a 3 week old over to someone’s house (think diapers, formula, burp cloths, extra clothes, etc. plus all the things my toddler requires. Typical of my mom, she brought over a grill and we all made burgers (I made portobello mushroom burgers for myself, with some grilled asparagus). And she left a ton of food, again typical of my mom. 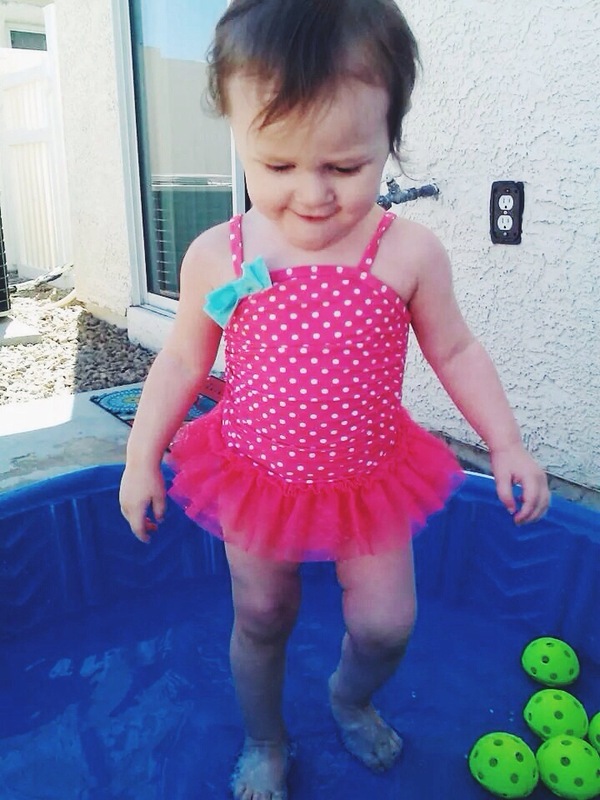 DeAnna purchased Juliette a small plastic pool for her to play with and like all new things she was obsessed. I had the idea to use the pool to fill with random objects (rice, beans, buttons, balls etc) and give Juliette the chance to have some sort of sensory game that I can leave her in for a short time. We filled the pool with a little bit of water but three seconds in Juliette slipped and face planted in the water (it was only like an inch) and she was done after that. When John got home we had a long talk. Having Jackson is so completely different from when I had Juliette. I don’t think I was ever away from her until she was 5-6 months old. I was so anxious to leave her (excluding her dad). But this time I am so anxious to get back to school. The main reason is probably because I just want to finish as soon as possible (I mean Juliette will almost be 3 by the time I am graduating anyway). I don’t know if other stay-at-home moms feel the way I do at times, but occasionally I get the feeling that I don’t contribute to our household, simply because I don’t bring any finances to the table. That’s not saying I do nothing all day. I mean, I take care of the house, kids, meals, shopping, budget. I know all that would fall to the waste side if I was working, because it did when I had a job. John and I constantly fought about dishes, laundry, and meals not being prepared. I was so tired, and worn thin from working that home life was less of a priority to me. When I was home I would have much rather played with Juliette than sweep up the dog food for the tenth time that morning. Neither one of us wants to be in that position again, but we can’t say that we don’t miss the extra finances (I was food serving, so at least bringing home an extra $100/day, on top of a paycheck). Is it worth it? Should I start serving again? I really hated it, and honestly I wasn’t really that good. I worked on weekends at a high traffic breakfast joint and I don’t care what anyone says, food serving is hard! I messed up plenty of orders, and that’s after having worked at the restaurant for a year already as a hostess. I knew the menu backwards and forwards, but I still always forgot to ask people what kind of toast they wanted. I don’t know if I am necessarily good at food serving, I think they only promoted me because I knew the menu so well, but no one taught me how to be a good server. I couldn’t multitask well to begin with and now after the birth of my second, my mind is even more gone. I just want to help our family financially. We have so many goals. We want to both graduate school. Cosmetology, for me (1.5 years left… at least….) and John wants to start a film degree of sorts from Full Sail, which will take him two years. We want to get out of Vegas, and get into the film industry. I’m really dying to take an airbrushing certification class. The sooner I get that cert. I can start working on the strip at some of the cirque du soleil shows. We don’t know if post graduation if we are going to try moving to California for work, but I know eventually we want to end up in Seattle. If John really wanted to make it big in film, I know that we would almost indefinitely move to California first, but if he’s thinking of working on more indie films, I think we could skip Cali and head straight for the North West. I just want to get back to school. Categories: Uncategorized | Tags: airburshing, Cali, California, celebration, children, cosmetology, film degree, Full Sail, memorial day, motherhood, North west, SAHM, stay at home moms | Permalink. Oh, hey! I'm Rhea. Mommy of 2, tea drinker, plant eater, day dreamer, amateur picture taker, home birther, life giver, arts and crafts maker, and personal chef to my tiny family. Follow along and read about our life as a young family living in Las Vegas trying to make it into the TV/Film industry. Thank you for reading!